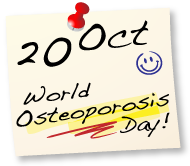 October is Breast Cancer Awareness Month and 20 October is World Osteoporosis Day. In promoting breast and bone health get 20% off your Mammogram & Bone Density scan for the month of October. Send us an email or give us a call to schedule your appointment. Alternatively you can make your booking online.